This web page aims to provide a quick reference so that readers can more easily discern the meaning of the valuable textual and translational information provided by the New Revised Standard Version of the Bible (NRSV). For a more complete explanation of the T&T notes, consult the section "To the Reader" in any edition of the NRSV Bible. The New Revised Standard Version of the Bible (NRSV) comes with a standardized set of notes to indicate "divergent textual readings and alternate translations." These notes make accessible possible alternatives even to readers who know no Hebrew, Aramaic, or Greek. However, the reader must have some idea of the principles of textual criticism and translation issues in order for these notes to be meaningful. In most NRSV Bibles these notes, here called "Text and Translation" or "T&T" notes, are found in the lower right corner of each page of biblical text. Do not confuse them with the "footnotes," which are usually all the way across the bottom of each page of biblical text, and which supply general information and comments on the text but do not usually speak directly about textual and translational issues. All NRSVs include these T&T notes, as well as the "To the Reader" section that explains their rationale and content. (2) "translational" issues, in which the original language wording is undisputed but there are alternative ways of rendering it in English. * the original language of the Old Testament is almost always Hebrew, with a little bit of Aramaic; the original language of the New Testament is Greek. Both textual and translational issues come into play as a translation is developed; the NRSV is unusual among English translations, in making detail about these issues consistently available to the reader. If you want to know more about a specific textual or translational issue in a particular passage, consult a good scholarly commentary with verse-by-verse notes. For textual issues, the standard NT reference is A Textual Commentary On The Greek New Testament, A Companion Volume to the United Bible Societies' Greek New Testament, by Bruce M. Metzger, available in various editions. The NET Bible also gives accessible, detailed textual and translational notes, and is available free online as well as in printed editions for purchase. Examples from both the Textual Commentary and the NET Bible are posted at the end of this web page. For a detailed example of analysis of "T&T" notes on a New Testament passage, I've posted Matthew 23:1-15. For some more examples of typical translational notes, as noted in the NRSV T&T notes, I've also posted a table of NRSV Translation Notes - Examples. In general the NRSV follows the Masoretic text (MT). Departures from the MT are noted, as are places where a different translation is plausible. etc. textual The alternative given in the note is from the Hebrew of the Masoretic text itself, or other ancient Hebrew "correction" manuscripts such as the Tiqqune sopherim. NRSV Gen 18:22 Abraham remained standing before the LORD. Note: "Another ancient tradition reads while the LORD remained standing before Abraham"
Meaning: The NRSV follows the MT, but there is credible evidence for the other reading, from ancient Hebrew scribal sources. Note: "Ch 2.1 in Heb"
Meaning: The NRSV follows the LXX chapter and verse numbering, which is traditional in Christian Bibles. Note: "Cn: Heb of all"
Meaning: The NRSV corrects "I ate of all" to read "I ate it all." Note: "Compare 2 Sam 23:8: Heb Thirty or captains"
Meaning: The Hebrew text at this verse clearly says "thirty" but the NRSV chooses to write "three" with no textual support for that choice. 2 Sam 23:8 has similar wording, with a textual note. But there is apparently no textual issue here. Note: "Gk Syr Vg: Heb Therefore"
Meaning:The NRSV follows the LXX, Syriac, and Latin Vulgate, which read "Not so", whereas the Hebrew of the MT reads "Therefore." 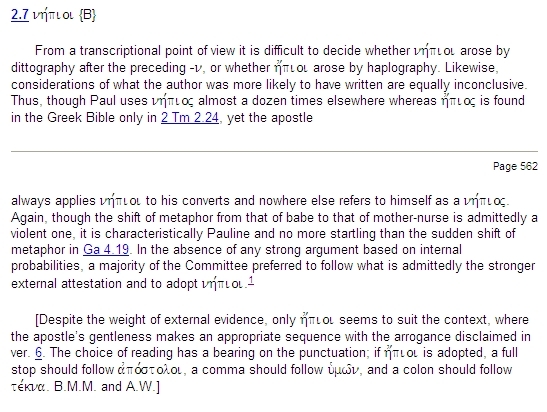 Heb textual The NRSV doesn't follow the Hebrew exactly, for text critical reasons; the footnote tells which alternative the NRSV is following. When no other Hebrew text is specified, "Heb" means the MT. NRSV Gen 21:9 But Sarah saw the son of Hagar... playing with her son Isaac. Note: "Gk Vg: Heb lacks with her son Isaac"
Meaning: The NRSV follows the the LXX and Latin Vulgate rather than the MT, which just says "But Sarah saw the son of Hagar... playing." Meaning: The actual Hebrew word is adam, which can be translated man, human, person, or Adam. See also the footnote on Gen 2:7, 5:1 and many others. Note: "Heb when Judah was comforted"
Meaning: The NRSV translates the MT's "Judah was comforted" as "Judah's time of mourning was over." Note: "Heb Mss Sam Gk See 1 Chr 1.7: MT Dodanim"
Meaning: The NRSV follows Hebrew manuscripts other than the MT, the Samaritan Hebrew text, and the LXX in reading "Rodanim", whereas the MT reads "Dodanim." Note: "Meaning of Heb uncertain"
Meaning: They really don't know what kind of wood it was. The NRSV guesses cypress, whereas the KJV just transliterates the Hebrew word pronounced gofer. NRSV Gen 6:3 "My spirit shall not abide in mortals forever"
Meaning: This entire phrase is controversial. MT textual The Masoretic Text, the principal ancient text on which the NRSV Old Testament is based. When no other Hebrew text is specified, "Heb" means the MT. Note: "Ezra 2.66 and the margins of some Hebrew MSS: MT lacks They had ... forty-five mules"
Meaning: This is a textual issue; the MT is at variance with other ancient Hebrew texts. NRSV 1 Sam 17:4 ...whose height was six* cubits and a span. Meaning: This is a textual issue; the MT is at variance with some of the ancient versions. Note: "Or when God began to create or In the beginning God created"
Meaning: The Hebrew can be translated into English in any one of these 3 ways. Click on the middle box in the header graphic for this web page to see more information about this actual phrase. Note: "Perhaps God of seeing or God who sees"
Meaning: The Hebrew name is "El-roi" and the note is telling the reader what it might mean. textual The manuscripts found at Qumran, sometimes called the "Dead Sea Scrolls." Note: "Q MS: MT cities"
Meaning: The ancient manuscripts of Isaiah found at Qumran read the way the NRSV has it; the Masoretic Text (MT) says "The treaty is broken, its cities are despised." Note: "Sam Gk Compare Vg: MT He removed them to the cities"
Meaning: The NRSV has decided on text critical grounds that the Samaritan Hebrew and Greek LXX versions' reading "he made slaves of them" is superior to that of the MT ("he removed them to the cities"). The editors suggest we also check out the Latin Vulgate. Note: "Syr: Heb and over all the earth"
Meaning: The NRSV has decided on text critical grounds that the Syriac version's reading ("and over all the wild animals of the earth") is superior to that of the MT ("and over all the earth"). Meaning: the Hebrew name "Nod" means "Wandering," so Cain "settled in the land of Wandering." Note: "That is the Well of the Living One who sees me"
Meaning: The actual Hebrew words are Beer-lahai-roi; Beer means "well", lahai means "of the living one", and roi means "who sees me"
Tg textual Targum - Ancient version of the Old Testament written in Aramaic NRSV Is 66:18 I am* coming to gather all nations and tongues. Note: "Gk Syr Vg Tg: Heb it is"
Meaning: The NRSV follows the Septuagint, Syriac, Vulgate, and Targum for this verse, which says "I am coming" rather than the MT "It is coming." Note: "Traditional rendering of Heb Shaddai"
Vg textual Latin Vulgate version of the Old Testament NRSV Gen 4:8 Cain said to his brother Abel, "Let us go out to the field." Note: "Sam Gk Syr Compare Vg: MT lacks Let us go out to the field"
Meaning: The NRSV follows the Samaritan Hebrew, Septuagint, and Syriac versions for this verse, which include the phrase, whereas the MT lacks it. The Latin Vulgate is worth comparing. The NRSV is based on the editors' estimation of the best readings from the very large number of ancient Greek NT texts, known as "ancient authorities," combined with the editors' estimation of the best way to render the Greek in English. Note: "Gk saw the star"
Meaning: Evidently the NRSV translators thought it made more sense to say that they saw that the star had stopped, rather than just that they saw the star. Or... translation The actual Greek text is not in question, but there are other possibilities for rendering it in English. NRSV Matt 1:1 An account of the genealogy* of Jesus the Messiah"
Footnotes: "Or birth" "Or Jesus Christ"
Meaning: The Greek word that the NRSV translates "genealogy" could be equally well rendered "birth", and the Greek words that the NRSV translates "Jesus the Messiah" could be equally well rendered "Jesus Christ." Note: "Other ancient authorities lack falsely"
Meaning: Some ancient manuscripts read "utter all kinds of evil against you falsely" and others read "utter all kinds of evil against you." The NRSV chose the former. 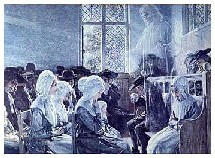 "though we might have made demands as apostles of Christ. But we were gentle among you, like a nurse tenderly caring for her own children." There's a T&T note on the word "gentle" which reads: "Other ancient authorities read infants." "although we could have imposed our weight as apostles of Christ; instead we became little children among you. Like a nursing mother caring for her own children." The textual issue here is a one-letter difference between the Greek words epioi (gentle; gentle ones) and nepioi (infants; little children).